To get started, you should adjust the bet size. We usually like to start with the Coin Value, which begins at just £0.01. Then, adjust the number of lines you want to bet on via Bet Lines, and then your Bet Level. We recommend that you bet on all 25 lines if you budget allows, as this would increase your chances of winning and it would only make it £0.25 per spin if your Coin Value is £0.01, which is really not bad for a progressive jackpot game. Once you have your bet set, you can push the Spin button! Just as an FYI, there is also a Max Bet button, which will set your bet to the maximum number of lines and the highest Bet Level, but it won’t affect your coin Value. Super Lucky Frog is a progressive jackpot slot, and if you’re looking to win that ultimate prize, then it all starts by spinning 3 to 5 of the Frog Bonus symbols, which will lead you to the bonus game. Once you’re in, you’ll find the Frog with a Wheel of Fortune. On the Wheel, there are slots for Super, Lucky and Froggy, plus a 1. 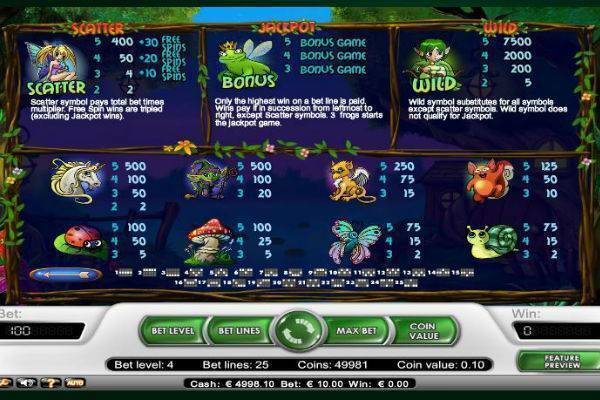 Super, Lucky and Froggy are the 3 progressive jackpots to the game, with Super being the biggest and Froggy being the smallest and you’ll see the exact size of each jackpot with an up to date ticker at the top of the screen. As you might guess, depending on where the Wheel of Fortune lands, that jackpot prize will be yours. Scatter Free Spins: Spin 3 or more of the Fairy Scatter symbols and you’ll activate a round of free spins. At 3 Scatters, you’ll get a 2x multiplier on your total bet, along with 10 free spins. With 4 Scatters, it’s 50x your total bet, plus 20 spins. 5 Scatters is 400x your bet, plus 40 free spins. There can be some serious wins here! Although Super Lucky Frog is one of NetEnt’s older games, the 2D drawings still look good. This is a beautifully illustrated and vibrantly coloured game. The characters are cute, and charming with their shy eyes. The music will keep you pleasantly accompanied. Set in a corner of a luscious and magical garden against a purple night sky, Super Lucky Frog is the perfect game to retreat into for a quiet, dreamlike evening. When it comes to progressive jackpots, it’s always the millionaire makers like Mega Moolah and Hall of Gods that make the news. However, jackpot hunters with a bit more experience know that more modestly sized jackpots pay out more often, and that chances of a win are higher than the big jackpot games. 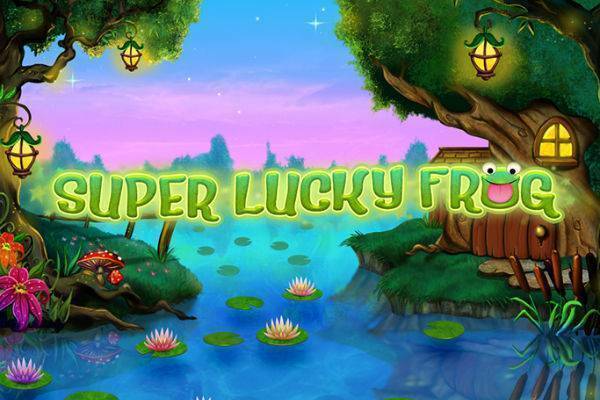 That’s why Super Lucky Frog is one of the top choices for many players. Of course, it’s also a pleasant looking game too! Check out this lucrative secret for yourself at one of these vetted online casinos.